You need to help to peaceful farmers and protect their home! Do not let the monsters to get into the castle. You have to protect the gate of the castle, order to the monsters could not get inside. It is best to play with friends in multiplayer but even without them you will be easy to kill all the monsters, because villagers and golems will help you making the process much easier. Also, some mobs were changed, zombie-pigman is now several times higher. 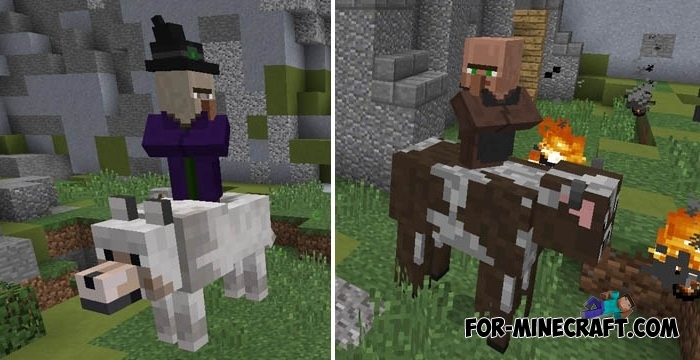 And the villagers and witches have learned ride on some mobs. The Castle Siege contains a map and a few add-ons for a more enjoyable gaming experience. A small video review which demonstrates the Castle Siege gameplay.